The Suzuki Bandit series are standard street motorcycles produced by Suzuki. Many versions of the bike have been launched over the years, including the GSF250 and GSF400 of 1989, the S models of the early 2000s and the GSX650F models produced from 2008. The newer 2010 Suzuki Bandit is available in two versions: GSF1250 and GSF1250A. Both models offer modern colour schemes and styling that propel the Bandit legacy forward into a new and exciting era. The 2010 Suzuki Bandit reveals new bodywork that give it a distinct street fighter look with a minimalistic naked look in the front’s half-fairing. An adjustable seat and stylishly redesigned turn signals, tail lights and headlights are add to the Bandit’s design. The front fender is fitted with a top box, big panniers and feature meticulous sharp lines. The motorbike also gives reasonable space for the passenger with a well-placed passenger grab rail that comes really handy as the bike does feel quite fast riding from the back seat. Longer-legged passengers might, however, feel a little cramped in the pillion because the rear footrest are set high. The Bandit’s chassis is relatively small compared to rival models in its class, but the motorbike does give a smooth ride with accurate swing on turns that attempts to make up for this short coming. The only time the Bandit starts to show signs of losing shape is when it is used too hard. One look at the 2012 Bandit’s specs sheet and you will instantly see why this bike is likely to appeal to a large section of motorcycle enthusiasts. It comes with an updated instrument cluster, LCD indicators that show gear positions, high beam and water temperature, oil pressure and fuel gauge and clock and analogue tachometer connected to an LCD digital speedometer. The Bandit is powered by Suzuki's impressive compact 4-stroke, 4-cylinder, 1255cc DOHC liquid cooled engine. The engine has been blacked out to give a refreshing, darker new look that adds to the bike's colour scheme. 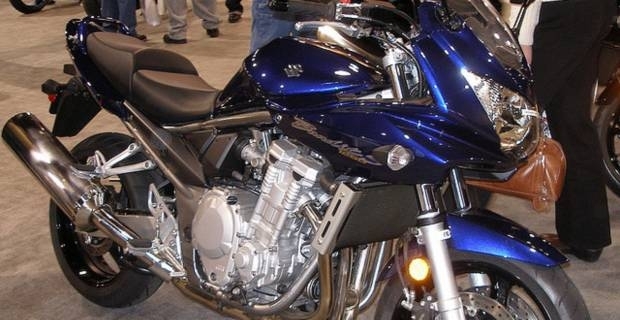 Both versions of the 2010 Bandit also feature Suzuki’s effective Dual Throttle Valve (SDTV) fuel injection system. The 2010 Suzuki bandit series might not match the sport touring design of the likes of the Kawasaki and Yamaha FJR, but it does give reasonable agility, easy handling and comfortable manoeuvrability. It comes with Telescopic front suspension to accommodate even heavier riders and is quite cheap to buy and run. In all, it is a capable motorbike that gives outstanding value. Owners with reasonable expectations will be contented with the motorcycle.